In the world of architecture, generating buy-in from the client or prospect is nearly impossible without the visual means to communicate design plans. Here are guidelines and tricks-of-the-trade to ensure that your project artwork is a stunning depiction of the unbuilt space. Before embarking on any visualization project, you must first understand the goal. 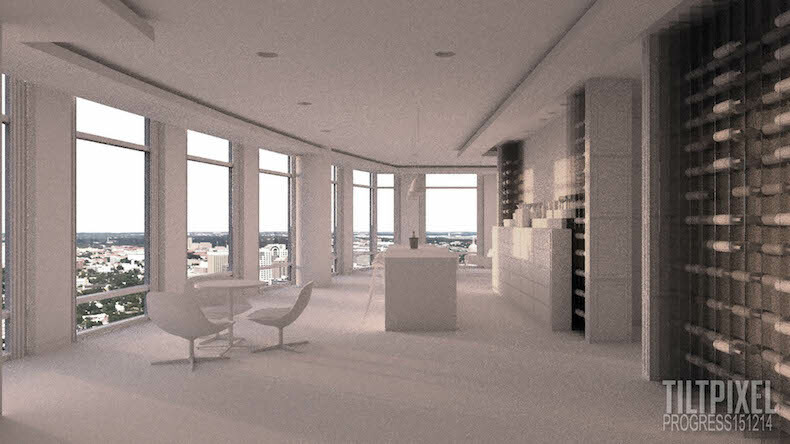 The focus of a rendering may vary depending on the needs of the client. Is the image intended to convey an idea, to create intrigue, or to project a positive sense about a new development? The long-term goal will drive the type of rendering, the number of renderings, and the need for any other visualization tools that may accompany the still images. Conceptual renderings are intended as a rough sketch to demonstrate a project idea. The photorealistic nature of the finished project is not the visual goal, since the project itself is still in the design stage. These renderings are useful for gaining buy-in from stakeholders before the intricate details of a space are firmly developed. Architectural renderings are used to convey the exact design and placement of elements such as staircases, light fixtures, or window mullions. Architects rely on these renderings to make design decisions or to convey plans to other stakeholders. The exact details of an architect’s plans are important to the final rendering. Marketing renderings are a key element of an overall marketing campaign for a building project. These renderings may pair with short films or virtual reality tours to generate excitement, educate potential tenants or owners, or raise positive community awareness for a landmark project. Marketing renderings may be driven by the architect, or by the developer or broker. If a design is not firmly in place, the visualization artist may have the freedom to play the role of designer, selecting finishes and completing the overall aesthetic. For the purposes of this course, we will focus on the process and techniques that can lead to the creation of stunning marketing renderings. Once a general idea of the image’s use is determined, the artist must refine the client’s intention by asking questions about the space. What about the site or architectural style is compelling, unique or important? A senior living condominium community is very different from a young professional’s penthouse. Start with some basic questions and work up in complexity: Where is the project located? What is the neighborhood like? What are the facility’s amenities? Should the space appear bright and cheerful, or toned down and sophisticated? What story are you hoping to tell through the rendering? The story, after all, is the most important part. A rendering is often just one component of a visual marketing campaign that has a measured purpose. Understanding the narrative that the client wants to convey is essential to producing a strong, balanced finished image. Asking the right questions will create a foundation for your decisions—from the right views and lighting, all the way to furniture and décor. Ultimately, the image must connect with the audience, whether it is the media, a room of top real estate brokers or a building owner, your rendering must sell the story. On a final note, it is also important to educate your client on the different mediums that can be delivered beyond still renderings. An animation or virtual reality (VR) platform may be more suitable than a still rendering for certain projects. Animation paints a broader depiction and a more engaging story than can often be found in a single image. VR enables full immersion, as it allows the participant to experience not just the aesthetics but the feel of an unbuilt environment. From hearing the acoustics to witnessing the change of light at a particular time of day, VR creates an elevated experience that can stir and enliven the viewer. Once the strategy is discussed and a plan laid, the process of creating the image takes shape. Engaging buy-in from the client in these early stages can prevent rework and change orders later on. Determine which camera views enhance the image, and recommend these views to your client. Providing an informed recommendation will often steer the client in a productive way, whether choosing just one view or several. Once a camera angle is determined, educate your client on the importance of backplates. The surrounding backdrop of a building or development can profoundly influence the quality of an image. If necessary, plan for custom photography or drone shoots to ensure that you have the best assets for your rendering. Effective communication, including regular check-ins, clearly defined schedules and change order policies, can greatly enhance efficiency. Asking the right questions and educating the client on both the art and the process of visualization will improve decision-making. Strong communication and a keen attention to detail will pave the path to success. Perhaps the most vital component, however, is an eye for artistry. Capturing a physical space through the lens of a camera is an art, and many photographers make their living by shooting the built environment. Reference is important, and TILTPIXEL artists are constantly reviewing work from other photographers, websites, magazines and photos. A good place to start is by studying some of the greats of architectural photography—geniuses like Julius Shulman, Ezra Stoller, and Lucien Hervé. After analyzing the works of these photographers carefully, you will spot noticeable elements and principles that repeat in many of their photos. Using these principles as a guide to your own imagery can help direct composition. Setting the mood. 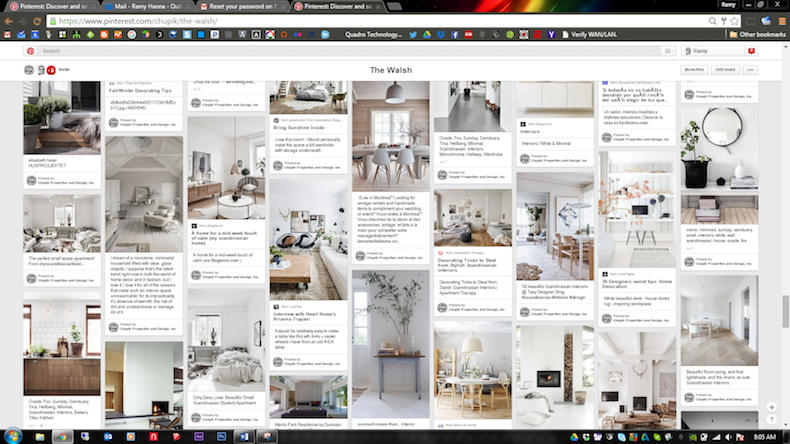 A visual way to understand your client’s goals and interests is to collaborate on a mood board. This can also be useful in determining the feel of your rendering. In the followng mood boards, the one on the left suggests that the content will be educational, for children—a school, or something for students. The center board is trendier, or for a younger generation. The board on the right is clearly more corporate, business, and professional. Notice how, based on the specific content, each board creates its own color or mood. Your renderings can evoke the same mood based on the colors you choose. Pinterest is nothing more than a modern version of a mood board. It is a simple way of not only organizing your style, but also conveying a mood or aesthetic to your client. In this image, the lighting is similar across all the thumbnails. 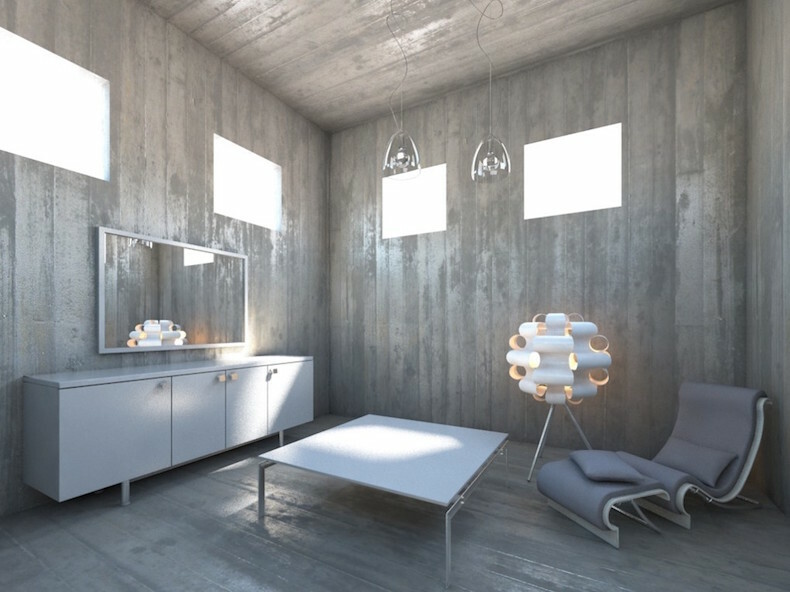 The consistency sets a certain mood or theme that will increase your chances of getting buy-in from your client on the style and lighting of the proposed rendering, all before diving into 3D software. Staging is the way elements are “set-up” to support the photo or rendering. 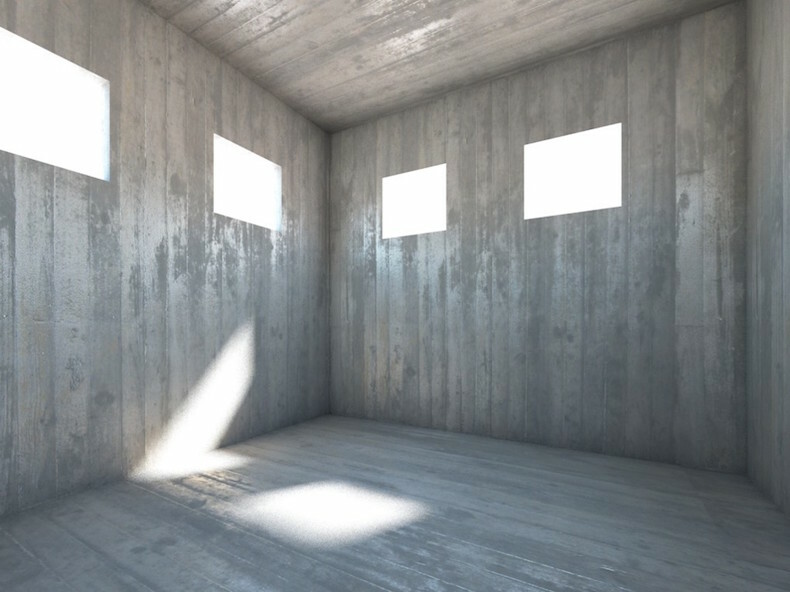 In this next image, the room itself is a basic box, very uninteresting. Staging should be used to support the client’s goals. 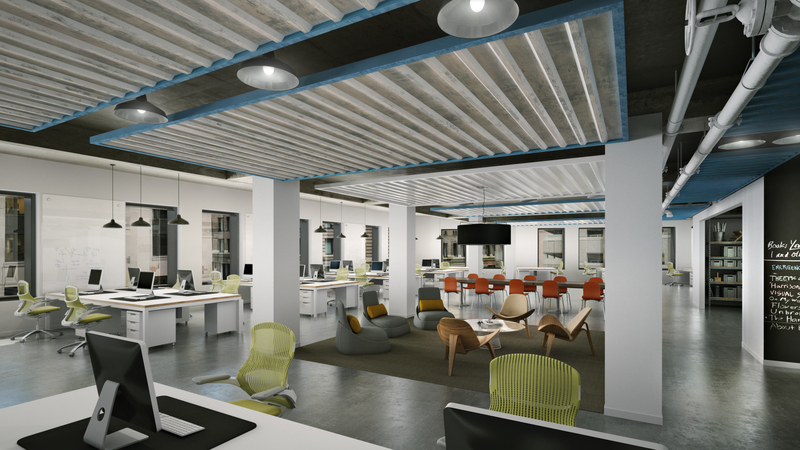 In the following two renderings of the same workspace, the image on the left is geared toward young, trendy tenants; the one on the right is targeted toward a more conservative clientele. Simply by changing the furniture, fabrics, and finishes, you can guess the type of businesses that would occupy each space. The image on the left could be a graphic design studio, print shop, or app development company. The one on the right could be a law firm or accountant’s office. The Rule of Thirds. This ancient rule dates to the mathematician Euclid. He discovered a spectacle in nature, which can be broken down into a simple equation or ratio. 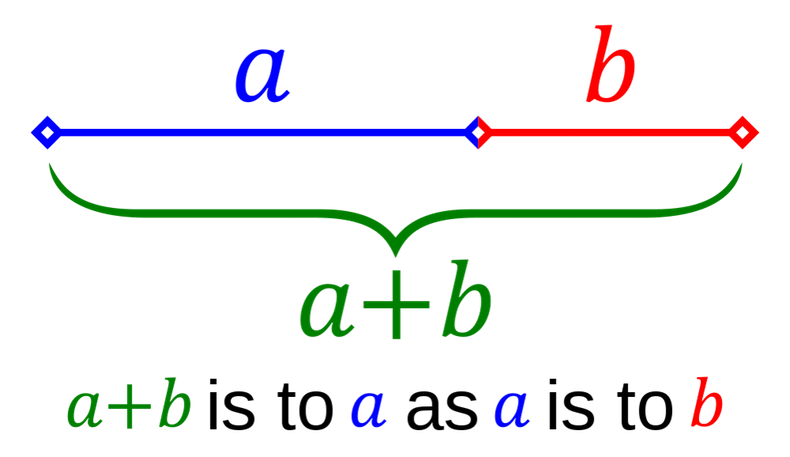 This formula, known as the Golden Ratio, states that the sum of the parts, a + b, is to a as a is to b. In short, there is a recurring pattern in nature that grows and shrinks in both directions based on this ratio. 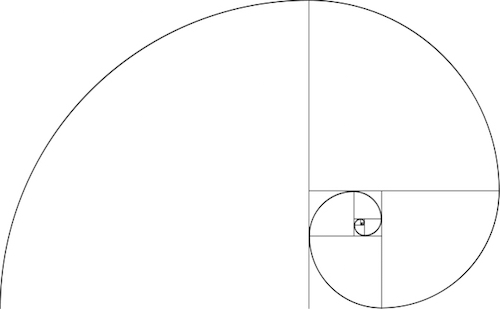 From the Golden Ratio came the Fibonacci Spiral. Leonardo da Vinci and countless other artists used this spiral and ratio in many of their works, including the Mona Lisa. From this spiral was derived a simplified version known as the Rule of Thirds. The Rule of Thirds refers to a grid that provides a way to frame your subject or content. If you break an image into three parts both vertically and horizontally, it will create points of interest. In the images below, the subject remains exactly the same. But the image on the left has the main landscaping element centered on the image, while the one on the right has the critical element lined up with the left vertical. This technique adds visual interest. For portraits, characters, or hero elements that compose a small portion of the image, aligning them along the circles adds visual interest. For most architectural renderings or photos, aligning the main elements of the building along the horizontal and vertical lines of the grid will add visual interest to a static building. Practicing this habit will quickly create a better composition for renderings. After some time it can become second nature when composing an image. Straight verticals. This rule can be considered the signature of architectural photography. Visually capturing a tall building and keeping it straight in the frame is not easy. Professional architectural photographers often use expensive tilt-shift lenses which, when used with an SLR camera, can distort the image to correct the verticals. Typically, if the photograph of the building has straight verticals, you can assume it was taken by a professional who understands this rule. Below, in the image on the left, the verticals have not been corrected, while in the image on the right they have been. Fortunately, you don’t need an expensive camera to achieve this effect. There is a very simple way to achieve this effect with a regular camera, or even with a smartphone. If you hold your camera straight up and down and not angled, then your image will be straight, or close to straight, when captured. You can also achieve this same effect in 3D programs that have virtual cameras and tools to enable auto-vertical tilt correction. The nice thing about most 3D programs is their automation. In real life, you must manually adjust the lens until the tilt looks correct. Diagonals to corners may be the simplest rule of image composition. The rule states that diagonals or perspective lines that “die,” or recede, into the corner of an image add visual interest to a photo or rendering. In the rendering below, this one-point perspective is successful not only because of the staging, but also because of the way the diagonals of the air ducts and rug die into the corners of the image, making it an even stronger composition. Avoid coincident edges. Camera placement and staging are critical this rule, which states that, if objects in an image are placed in such a way that their silhouettes are tangential to or overlapping other objects, the depth gets lost and the image becomes flat and difficult to read. Below, the image on the left appears somewhat flat because the edges of the dresser and table are overlapping. The image on the right is a better composition because there is space between the objects. This effect not only produces a more legible image but adds depth. This composition can be achieved in two ways. If the view is already established, you can simply stage the space—in other words, you can move the furniture so that it lines up correctly through the camera. Or you can move the camera around slightly until some overlap of furniture can be seen in the view. Understanding the three Principles of Photography and applying the four Rules of Composition provides the foundation on which to build a winning image. A rendering that does not adhere to these practices will have difficulty standing on its own regardless of how realistic the visual elements appear. Studying the composition, staging, and mood of an image is one aspect of digital artistry. It is also important to dissect the details that make a rendering look photoreal. After studying countless photos, our technical experts have discovered nuances that make a rendering look exactly like a photograph. For example, a camera cannot capture two lights of different intensity with the same visibility that the human eye can perceive. This is why in interior photos the sky often appears white and blown out. The reverse is also true: in outdoor photos, the interior space is often dark and nearly invisible. Vignetting occurs when brightness is reduced around the periphery of an image. This is traditionally a limitation of the lens; however, we use it in our renderings intentionally for creative effect. This can be done in 3D rendering software to mimic real-life cameras. The image above on the left has no vignetting; the image, on the right (a somewhat drastic example) does. 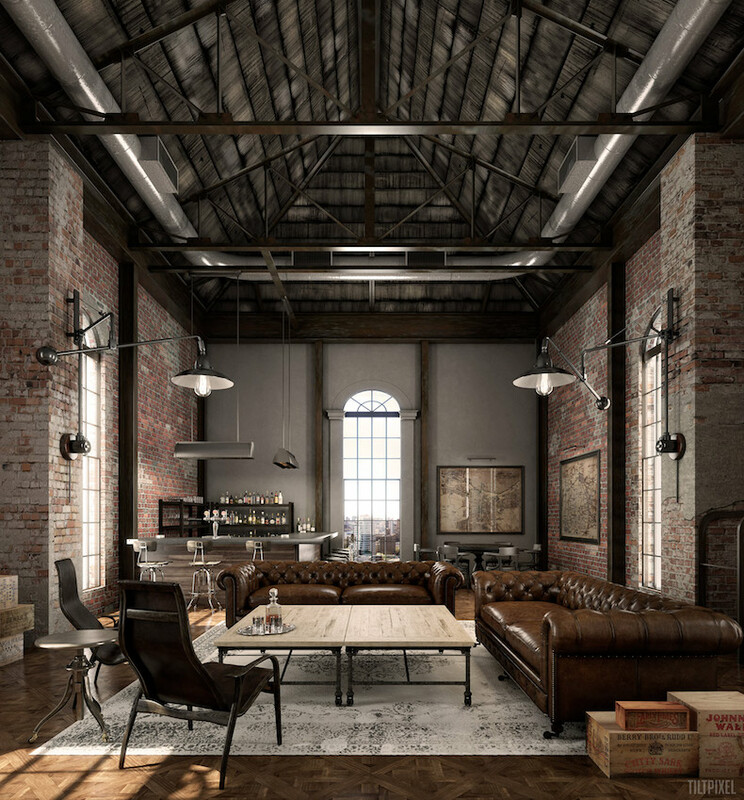 Vignetting can be used in renderings to evoke a particular mood. Chromatic aberration, another type of distortion, occurs when a lens cannot focus all of its colors to the same convergence point, resulting in color fringing. This is especially noticeable in areas of high contrast, such as a tree against a bright sky, or a window frame against the sky. Used correctly, this effect can make a rendering look like a photograph. A word of caution, however: This technique can easily be very overused, and, if executed poorly, will produce a very distracting image. As with all photographic techniques, this effect needs to be used subtly. If a viewer comments on a rendering’s color fringing, then the effect has been overused. Barrel distortion is a different type of lens distortion, typically an undesired effect that most camera lenses produce. Almost all lenses have some distortion. In 3D renderings, a virtual camera does not create this effect since there are no real optics, just a simulation. Adding flaws like this, however, can trick the mind into thinking the image is a photograph. 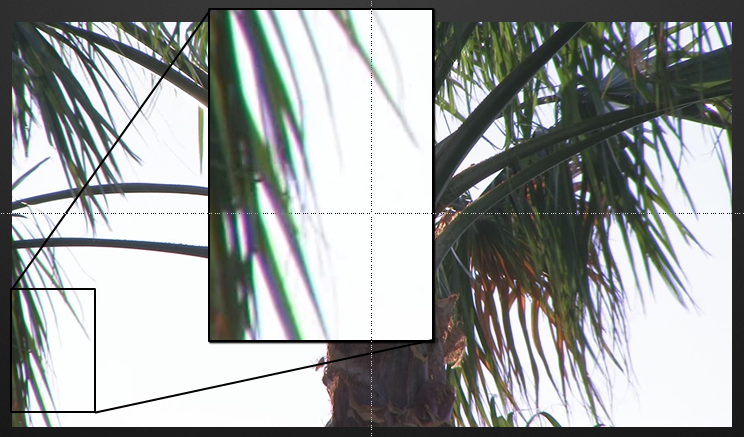 Vignetting, chroma, and lens distortion can all be created in 3D, but it’s much easier to add these elements in post-production software such as Photoshop. Adding these effects in post gives you real-time feedback with the results. If you don’t like them, you can undo them. 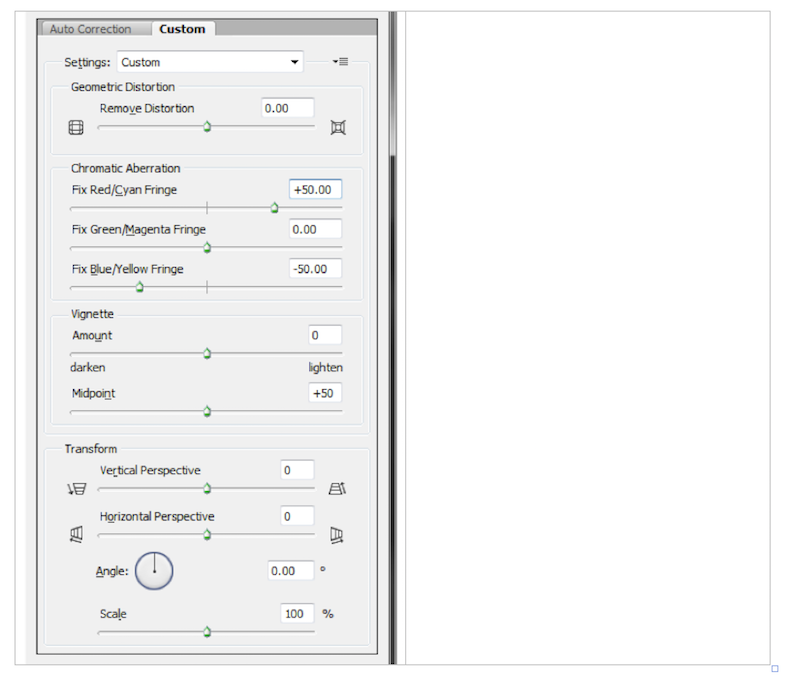 Using Photoshop, you can go to Filter à Lens Correction, then click on the Custom tab. This dialogue gives you access to all of the effects described above, with instantaneous results. For chromatic aberration, we typically go negative on the Red/Cyan. For Vignetting, you can control the amount as well as the spread of the gradient. Blooms in photography refer to the brightness that spills over from a point of light to the darker areas of an image. Bloom often results from oil or grease on the camera lens or sensor allowing the light to disperse over an area. Again, this is not something that is perceived in reality but only in photos. Sometimes strong sources of light get scattered in the lens and create unusual shapes known as flares. This effect can at times cause an image to look washed out, and it can create a starburst effect or rings. Because this is an effect the lens creates, we can replicate it in a controlled environment to not only make a rendering look like a photo, but also to help tell a story. There are several ways to create this effect for renderings. 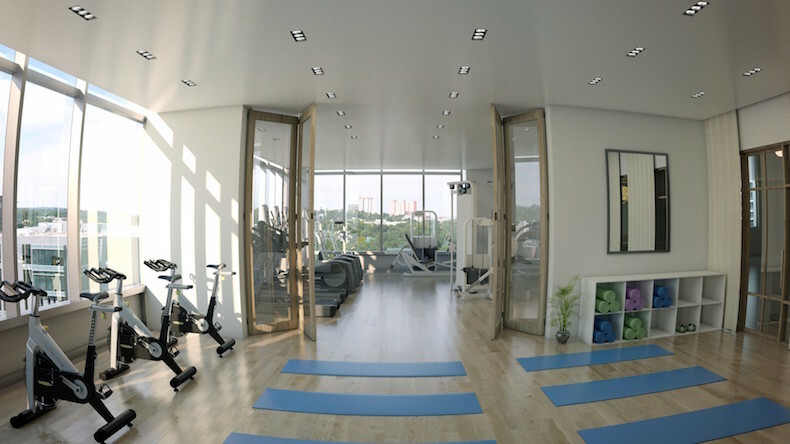 Our artists use V-ray, which offers V-ray Lens Effects. 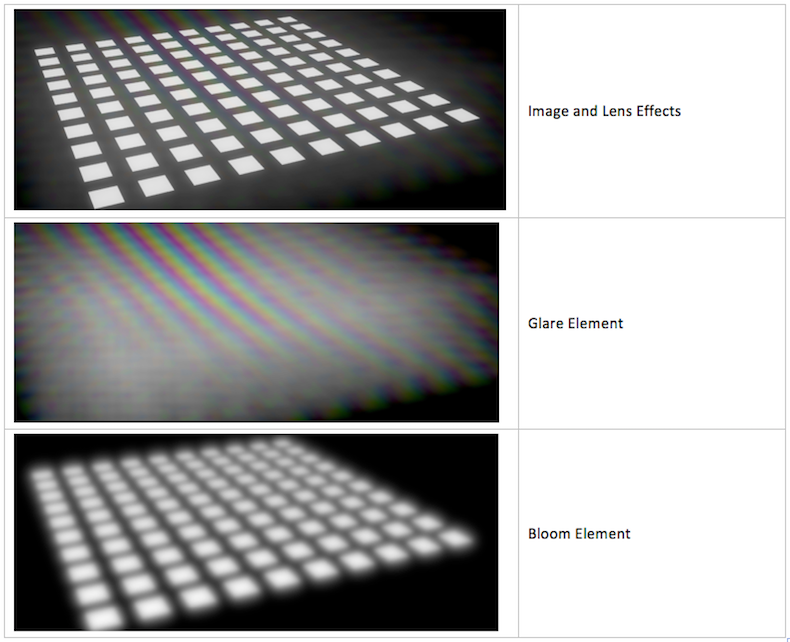 The power of this tool lies in its ability to split the image and generate render elements for each bloom and glare effect, as shown in the corresponding images below. Depth of field is the distance between the nearest and furthest objects that give an image focus in a camera. There are several factors that influence a camera’s depth of field, including the field of view and the aperture. The smaller the aperture on a camera, the shallower the depth of field and the greater the blurriness. The narrower the field of view, the greater the depth-of-field effect becomes. Depth of field can be used to make an image appear interesting, but also draw attention to a portion of an image. It's important to understand how depth of field works with a real camera. In renderings using 3D software, the rules of physics can be broken to achieve effects that cannot be created with a physical camera. If this occurs, when looking at an image, it can create the feeling that something is not quite right. Following the rules of physics and reality will only make renderings feel more authentic. Applying these phenomena in conjunction with the three principles of photography provides the foundation on which to create impressive architectural renderings. Knowing the principles is half the battle. Applying these techniques requires practice, looking at photo references, and studying images. Case studies can highlight these photographic principles at work, bounded by the constraints and needs of a real-life client with tangible goals. 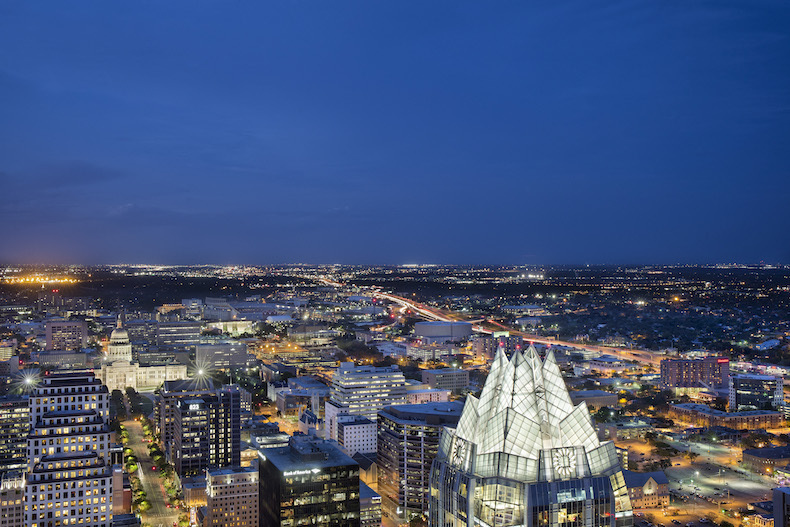 For the Austonian, we were tasked with providing images to advertise the tallest penthouse in Austin, Texas. The project was an existing space, but rather than furnish and photograph it, the client asked us to do the same thing digitally. Not only can digital renderings be faster, but they are often more cost effective and flexible in allowing for changes to interior design. The first step was to set up the 3D model to capture rough greyscale renderings, thus establishing the camera angle and view. For this project, backplates were critical. In basic terms, a backplate is an image that captures the scene without the main component or subject—in this case, all the furnishings and fixtures. We shot photography from the top of the building to get cityscape images that would later play a large role in our renderings. 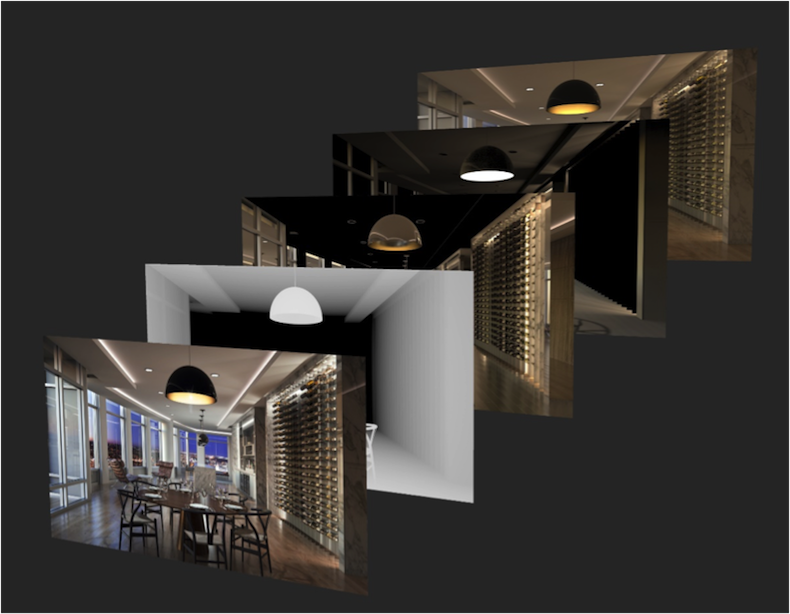 This not only established the mood and tone, but also allowed us to layer photos into our 3D software to enhance the lighting and reflections. With the photography in place, we matched the mood to our rendering. Our 3D software allows us to generate several different passes or layers that can later be used in a post-production program like Photoshop to fine-tune elements such as reflection, refraction, depth, and mask selections. Having this much control over an image not only gives us flexibility, it also allows us to tell the client’s story through atmosphere and feeling. 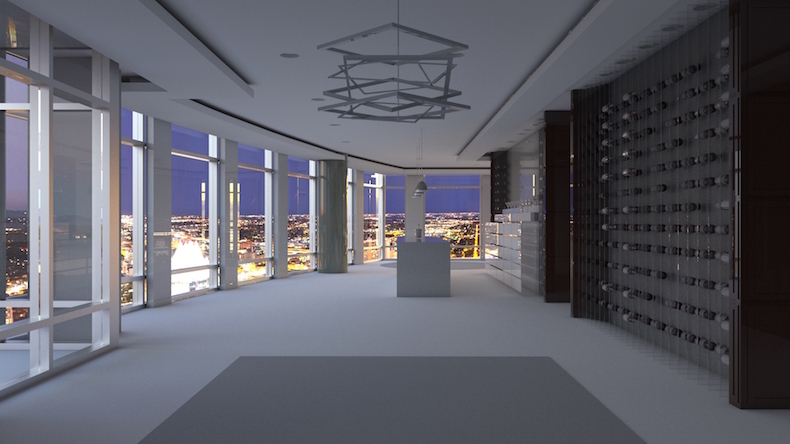 Ultimately, we were able to produce renderings that looked authentic and communicated the client’s message. The imagery was just one component of a larger marketing campaign, and our renderings fit seamlessly within the client’s strategy of emphasizing height and luxury in the living units. The renderings not only tell the story, they sell the story. Beyond renderings, we use other tools—animations, virtual reality, websites, short films, virtual reality, etc.—to communicate a space and experience to viewers. Whether you’re an architect selling a design idea or a developer trying to sell a rental space to a potential tenant, it’s important to understand visual communication. However, understanding the impact of visuals and how to use them to tell your story can be the difference between a simple, underwhelming image and an award-winning project. The true goal is to deliver imagery that can support and embolden a campaign. The client’s marketing team may be inserting your images into a printed catalog or incorporating them into a property website. The look and feel of the renderings must closely match that of other printed and digital media to ensure consistency across mediums. Creating a robust marketing toolkit allows the client’s story to be experienced through multiple platforms, with one visual communication supporting the next. 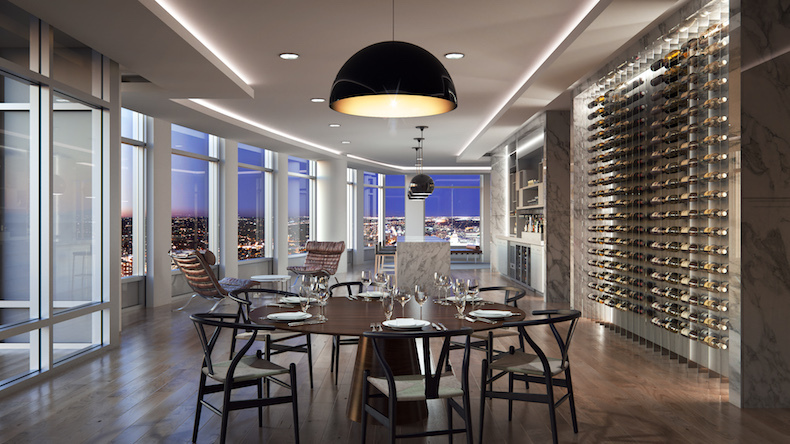 Dynamic and impactful renderings are driven by attuned project management, with careful and consistent client communication, and visual artistry based on long-standing principles of photography. Understanding the client’s goals and asking the right questions can enable skilled designers to create illustrations that paint a meaningful story. Appreciating the art of photography, using reference images, and planning the visual aesthetic with buy-in from the client can spell success for your project. Both effective and striking, these are the renderings that sell. 1. Select your 3D software and master it. Don’t bounce from one program to another. By sticking with one toolset, you will uncover the tips and tricks that can elevate your imagery, and you will be able to more accurately predict your timelines. Programs like 3ds Max, SketchUp, Rhino and Revit all offer unique advantages. It’s OK to base your decision on your own preferences and budget, or your choice may be dictated by your firm. Whatever your route to a 3D program, embrace it and learn everything you can about it. 2. Develop a thick skin in the face of criticism. You will get feedback from clients on progress renderings, not always what you want to hear. Not every rendering will be an award-winner, but consider each one an opportunity to refine your imagery and gain buy-in from the client. Remember that serving the needs of your client is the end game. You may disagree with a camera view or design decisions, but if your client is happy, then your deliverable is successful. 3. Never assume that there is only one way to do something. Three-dimensional software is constantly advancing. Exploring different techniques and tools can enhance your skillset and resolve the trickiest of problems. 4. Don’t forget to use reference imagery. Before embarking on a project, remember to study reference images—pictures from magazines and books, images from web searches, even a trip to the local art museum—to gain buy-in from the client on the overall mood or aesthetic. This research will save time in the long run. 5. Seek internal reviews of your work. Others catch what you may have missed, and getting more eyes on your project, prior to client feedback, can elevate the quality of your renderings. 6. Avoid stuffing too many topics of interest into a single rendering. If the client chooses to focus on multiple points of interest, don’t try to jam them all into one rendering. Visualize the project from several camera views spread across multiple renderings, each emphasizing a distinct point of interest.